What better premise can you start the new year with than a novel about a bookshop which is so successful jealous book trade folk start to take murderous steps against the owners? The bookstore at the heart of the story opens in Paris (well you couldn’t quite imagine any of this happening in Abingdon – or could you?) 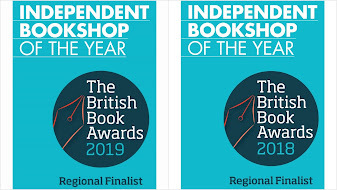 and is determined to buck the trend of the almost inexorable drift towards the internet and supermarkets and the favouring of commercially-hyped authors who can succeed in that environment. ‘The Good Novel’ bookstore promises a superb and alternative browsing experience by stocking only ‘good’ novels. And that’s where the trouble starts – as how does anyone define a good book? Owners (Ivan, a one-time world traveller, and Francesca, a ravishing Italian heiress) decide to put together a list from a secret committee of writers. The resulting titles are almost all classics, some are tracked down by the owners who can only offer them for sale second hand. It’s all very exciting. The trouble starts when very few new titles are taken and the literary establishment is less than pleased. Articles start appearing in the Press accusing it of elitism. It all takes a turn out of bookselling angst into thriller, as the bookstore is targeted first in the Press. Then its supporters are injured and attacked in a series of bizarre incidents. But more than anything ‘The Novel Bookstore’ is an interesting read for anyone who fears for the future of the novel and I doubt many booksellers will be able to read this book and not reflect on how much it mirrors his/her own business. It sounds a little like Mostly Books! Although one main difference is that we also stock non-fiction and children’s books. And last time I looked we weren’t quite so successful people were trying to run us over in the street (be careful what you wish for). That love of good books and the wanting to share – the hand-picking of titles, and the love of recommending the right read to the right person. There are certainly the reason a lot of independents out there are still in business. It certainly made me realise how little I know of the book trade in other countries, or even of the key novelists of other nations. Or even how bookstores in France get their books delivered (fascinatingly different – they have to take all of a publisher’s new titles and have no ability to choose). There were certainly surprisingly few books chosen that were written in English. I’m sure lots of people will read it and feel they want to turn to someone and demand why no Dickens? Austen anyone? But at its heart it is a thought-provoking read about whether bookshops are destined, very soon, to become things of the past. And what their role should actually be if they are going to have a future. When it launches ‘The Good Novel’ is welcomed and successful, but I did find a growing niggle with the fact that they were quite so picky about promoting new titles. Surely if, as a bookstore, you are concerned about the future of the novel, would you not be keen to stock new novels? After all, persuading people to take a risk on a new author is one of the roles we see as important at Mostly Books. If you don’t take a few risks and encourage fresh blood, classics are all we’d ever read. Eventually. The other element of the novel I struggled with was the fact that the owners assumed it would fail as a business, and one sub-plot is how the Italian heiress bankrupts herself to keep it going. Even though at every stage the description is of the shop being packed, its internet sales thriving and pressure from people abroad demanding a local version. 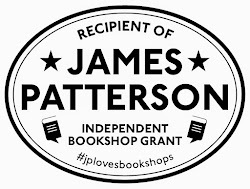 Incredibly supportive customers are the lifeblood of our business – and Mostly Books is lucky to have so many. But that doesn’t mean you don’t want to be there in a few years’ time and realise you were the last one to read the writing on the wall. Is there still a future in bookselling? Now about to go into our sixth year, the retail environment grows ever tougher, as we endeavour to ride out a perfect storm of recession, digital growth and Internet dominance. Whatever discussions there on the recession, most seem to agree it will get worse in the short term. But despite all this, sales of paper books are not in a massive decline. The Good Novel’ definitely seemed to have something right in building a community of enthusiastic readers around its shop. It’s customers were all motivated to go there as they wanted to find something stimulating and worthwhile to read every time they came in, and to find expert recommendations and professional advice which they felt they weren’t getting from the internet or supermarket browsing. It is still a joy for us to welcome customers both new and long-standing, who enjoy the serendipity of a browse – and who see the purchase of a book they know they are very likely to enjoy, as money well spent. 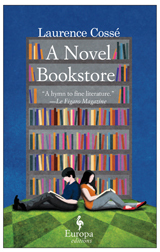 We are always finding new books to enthuse over and long to share – of which ‘A Novel Bookstore’ is definitely one. Adding this to my TBR list, not only because I read ANYTHING that has been translated from French into English, but because your right up is so thorough. Apparently she was born where I now live. Oh and did you know that there is now: A good novel bookstore in Paris? A real 'Good Novel' bookstore? What a good idea. I like the sound of that.